The best part of my job is getting out and about on door-to-door rounds. If you’re a natterer like me, there’s nothing better than meeting lots of new people, answering your questions and helping you to recycle. Some topics crop up time and time again. Alongside “Where did you get that fetching CBC t-shirt?”, some of the most frequently asked questions are to do with putting rubbish out for collection. Household rubbish and recycling can go out on collection day on the boundary of your property and should be separate from your neighbours’ rubbish. Can I put rubbish and recycling out on the verge? It’s completely fine to put your black bags/bin and recycling on the grass or near the roadside if you need to, as long as it’s only on your collection day. If you live in a flat, your landlord will be able to tell you where to put materials for collection. Don’t the Council give fines for putting rubbish in the wrong place? There are only two reasons that the Council would issue a Fixed Penalty Notice for waste. One is if you deliberately move your rubbish somewhere to conceal it and cheat the black bag/bin limits. The other is if someone consistently puts out too much black bag/bin rubbish and doesn’t bring it back onto their property – an unpleasant situation for the neighbours that would result in warning letters and then a Fixed Penalty Notice. What time should my rubbish go out? To make sure it’s collected, it’s best to put your recycling and waste containers out before 7am on collection day. And to keep the pavements clear, everyone should bring them back in as soon as possible after the collection vehicles have done their work. How much space can my bags/bins and containers take up? Badly placed containers can block the pavement, forcing people with wheelchairs or pushchairs into the road and potentially putting them in danger. When you put your bins out, ask yourself if someone in a wheelchair could get past and try to place them in a considerate way. What should I put out this week? When does putting rubbish out become fly-tipping? Illegally-dumped waste is damaging to the environment and unpleasant for local people. If someone leaves piles of rubbish or bulky waste in the street, a public area or private land when they know it won’t be collected, they may be prosecuted for fly-tipping. If you think someone is doing this in your street, you can report it on the Council’s website. That’s it in a nutshell (which, by the way, you can recycle in your food waste caddy… okay, I’ll stop!). I hope I’ve helped with any recycling questions you have. That said, if you see me out and about in your street, please still come and say hello… and keeeeeeeep recycling! 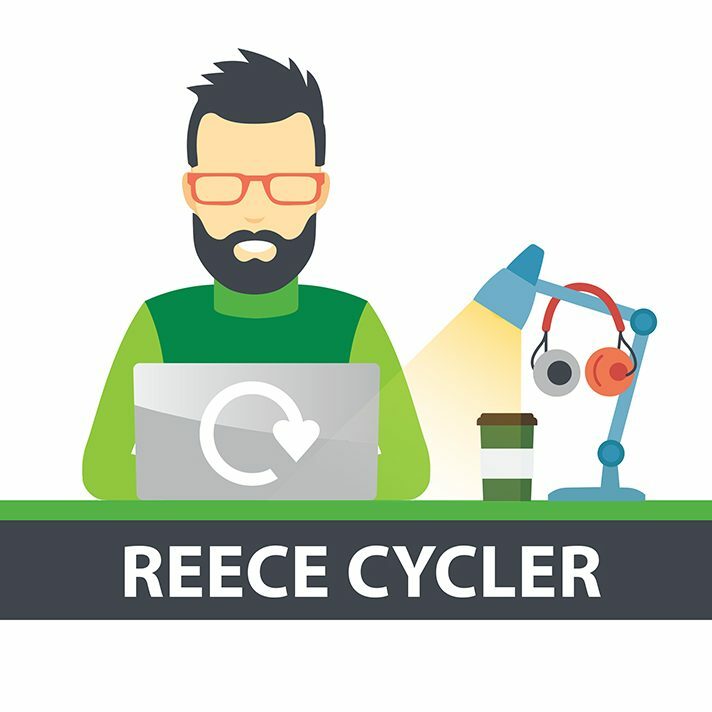 Hi Reece – am I allowed to put plastic milk bottle tops in the recycling bag? And what about those little strips of plastic you pull off the neck before you unscrew the lid? That’s a great question. You can definitely add your milk bottle tops and little strips of plastic around the outside of the bottle neck to your plastic recycling bag. The processing plant we use for our plastics is very good at finding ways to recycle as much plastic as possible. However, you are not able to recycle the disc seal inside the cap (which is fixed to the bottle) as that contains foil and will need to go into you black bag/bin. So if we don’t separate the 3 different parts (bottle, top, and seal) of a milk bottle will it still get recycled?